Computers and Structures Inc is the developer of 6 civil engineering softwares currently listed at CESDb. 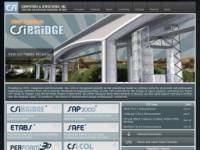 Please visit developers website for software support, product updates, licenses and other information about SAP2000, ETABS, CSiBridge, SAFE, PERFORM-3D, CSiCOL. SAFE is the ultimate tool for designing concrete floor and foundation systems. From framing layout all the way through to detail drawing production, SAFE integrates every aspect of the engineering design process in one easy and intuitive environment.